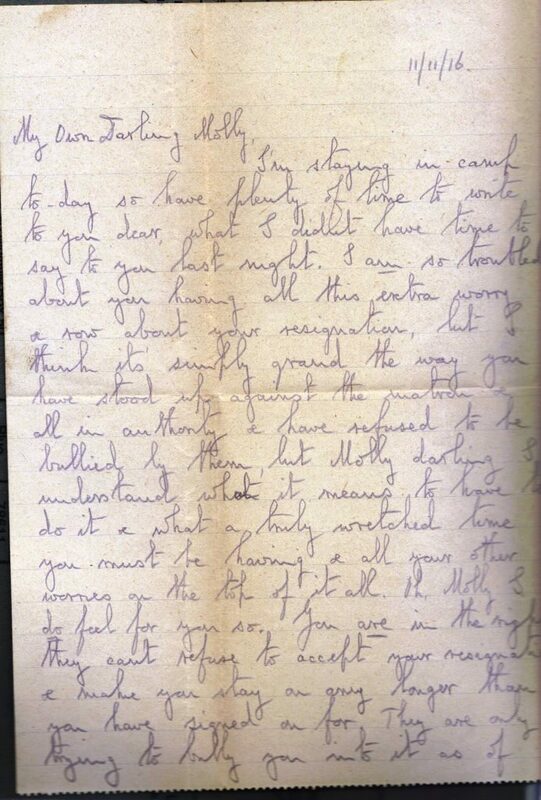 This letter was written on 11 November 1916 – shortly after Noel Downing had returned to the trenches after taking up his commission in the Welsh Guards. 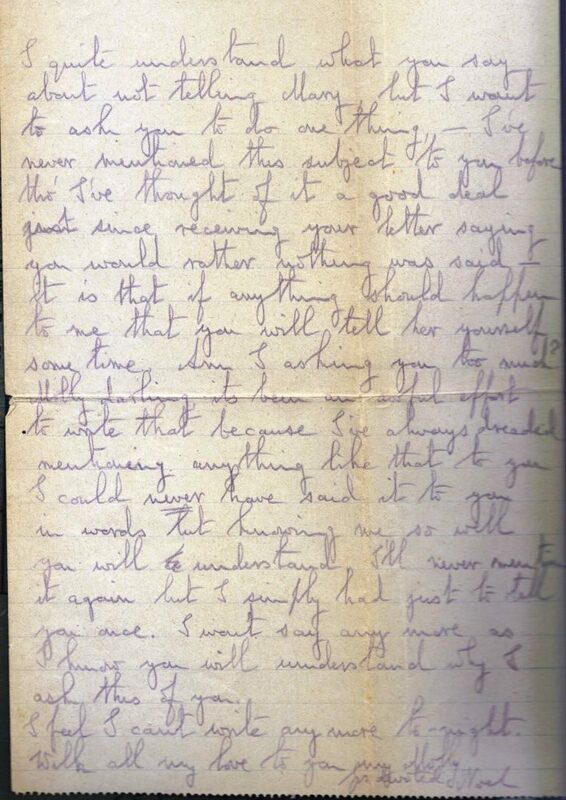 Molly Evans was about to formally resign her nursing post in France to return home to look after her mother, whose health had deteriorated after the death of her brother Wilmot on the first day of the battle of the Somme, 1 July 1916. 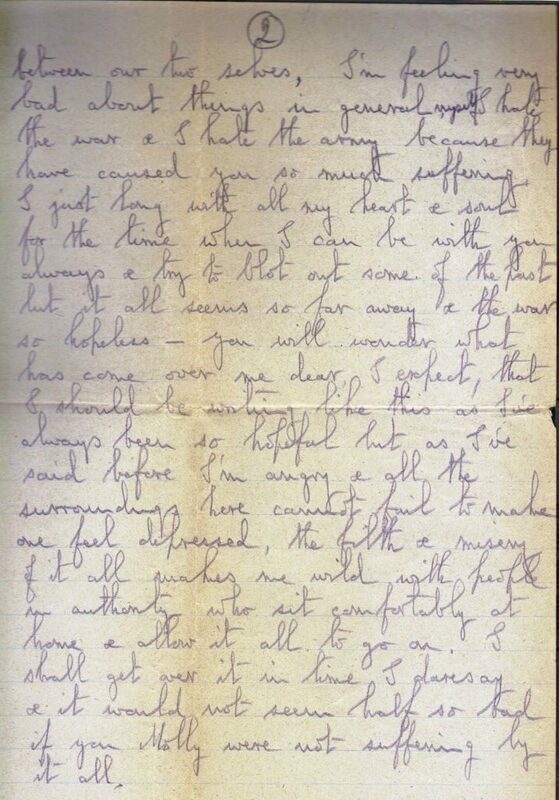 I’m staying in camp today so have plenty of time to write to you dear, what I didn’t have time to say to you last night. I am so troubled about you having all this extra worry, a row about your resignation, but I think it simply grand the way that you have stood up against the matron & all in authority and have refused to have been bullied by them, but Molly darling I understand what it means to have to do it & what a truly wretched time you must be having & all your other worries. Oh Molly, I do feel for you so. You are in the right, they can’t refuse to accept your resignation & make you stay on any longer than you have signed on for. They are only trying to bully you into it as of course you know, they are bound to let you go if you stick to your point, but I know how horrid that is for you, & you have three weeks more of it which makes me feel so angry, it’s not often that I get angry Molly, but I am now, angry because I am so helpless to do anything for you or be with you and tell people what I think of them. Molly darling, I take no notice of what you said in your letter about it being just as well that I should not be at home when you went back because you might be horrid and hard to me, you may be feeling so bad about things that perhaps you really thought it possible, but I have no fear about it, because I understand you better than you even think I do & am absolutely confident that however hard you were feeling about things if we were together our love for each other would overcome it all just between our two selves. I am feeling very bad about things in general myself, I hate the war and I hate the army because they have caused you so much suffering. I just long with all my heart & soul for the time when I can be with you always & try to blot out some of the past, but it all seems so far away & the war so hopeless – you will wonder what has come over me dear I expect, that I should be writing like this as I’ve always been so hopeful but as I’ve said before I’m angry and all the surroundings here cannot fail to make one depressed, the filth and misery of it all makes me wild with people in authority who sit comfortably at home & allow it all to go on. I shall get over it in time I daresay, & it would not seem half so bad if you Molly were not suffering by it all. 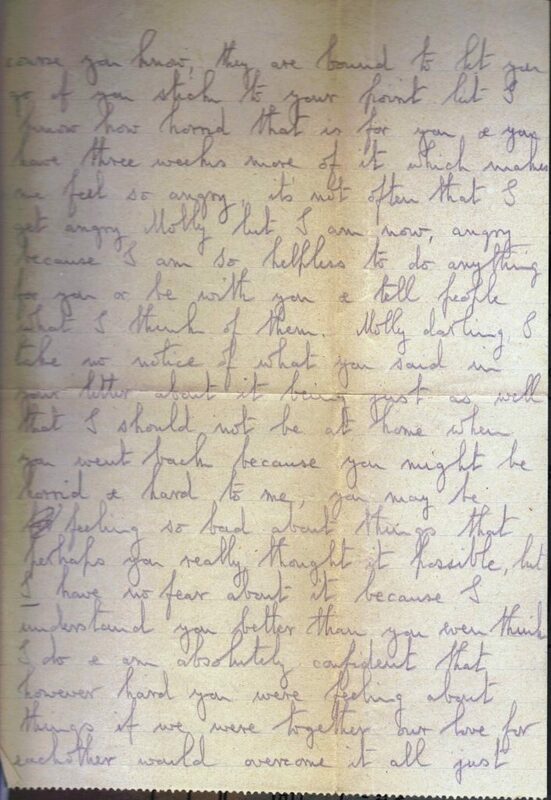 I quite understand what you say about not telling Mary, but I want to ask you to do one thing – I’ve never mentioned this subject to you before, tho’ I’ve thought of it a good deal, since receiving your letter saying that you would rather nothing was said – it is that if anything should happen to me that you will tell her yourself some time. Am I asking you too much? Molly darling it has been an awful effort to write that, because I’ve always dreaded mentioning anything like that to you. I could never have said it to you in words but knowing me so well you will understand. I’ll never mention it again but I simply just had to tell you once. I wont say any more as I know you will understand why I ask this of you. I feel I cant write any more to-night.